So we awoke to super gusty icy cold winds. It was so cold that eating or making coffee was not even an option. It was time to walk ourselves warm. What usually takes maybe “2 miles” took practically all day. Our packs were still heavy with food and water and the trek up to Baden-Powell alone is steep and laborious, so add freezing 50-60mph gusting winds and you have a recipe for colorful language, frozen faces, fingers and lots of snot. More than once we were nearly blown off our feet. The wind would gust, catch your pack and or leg as you lifted it to take a step and immediately you’d be struggling to regain your balance before being knocked down. One time a gust hit me so hard at the top of one ridge that had it not been for Paul catching my arm as I was losing my balance and fighting to stay on the “uphill” side of the ridge, I probably wouldn’t be writing anymore. 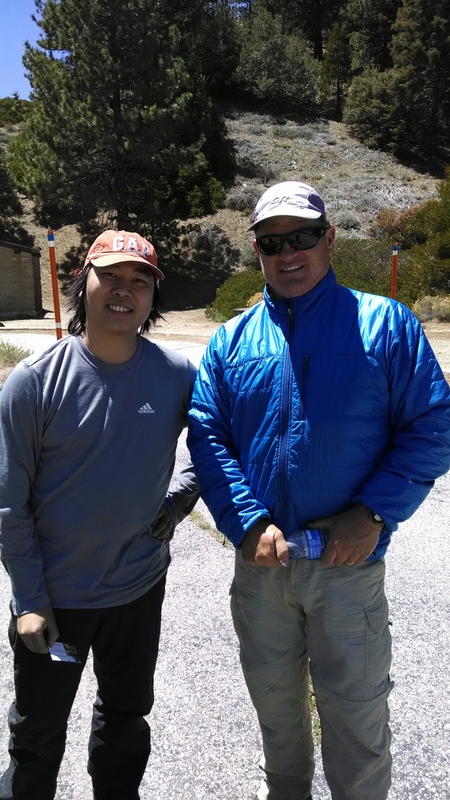 Battling the wind, cold and elevation was challenging and exhilarating at the same time. Don’t get me wrong, this was far from fun, but still exhilarating. We finally found a place out of the wind (not really, but at least it wasn’t gusty) and had breakfast. We cupped our coffee as make shift hand warmers and ate crushed “pop tarts”. 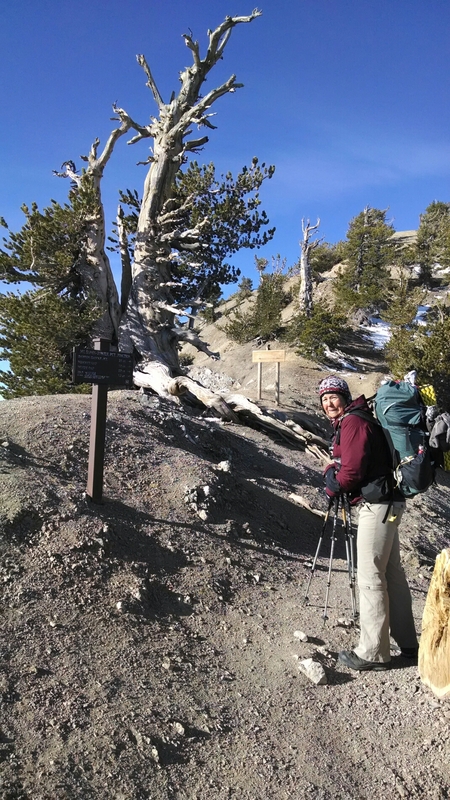 We checked our maps and apps and figured we had 6 more miles till water at Little Jimmy Spring. Onward we trudged with our heads bowed against the wind right past the turn in the trail that would take us to Little Jimmy Spring. The trail we continued on was well worn and behaved like the PCT (taking you indirect routes to places you want to be)…all the way down to Hwy 2. A 1500 ft. drop in elevation. What? What the heck happened? Worse yet…we are out of water. 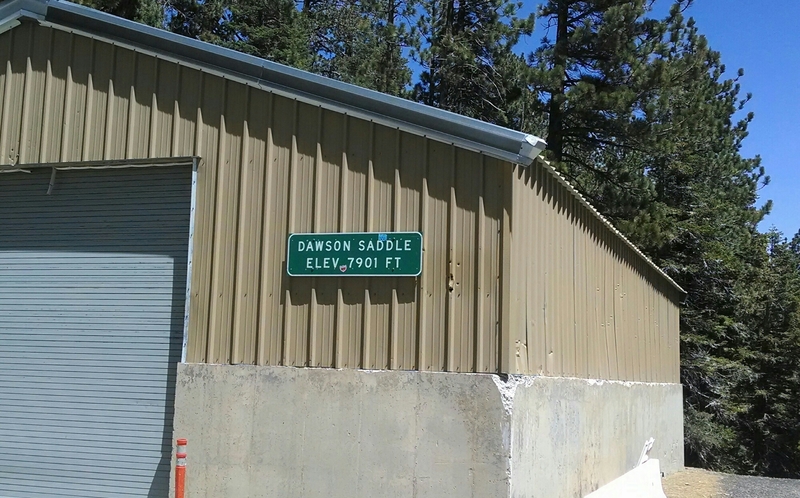 Turns out we were now at Dawson Saddle six miles from where we want to be. At least we were out of the wind. Hmmm. What to do next? Go back up or road hike? After what we just went through, we were not going back up anything so road walk it was. Several motorcycles passed us…going in the opposite direction. An hour goes by, we have the two lane Hwy still all to ourselves. A Caltrans snow removal type truck goes by (in our direction), Paul puts out his thumb. The guy waves at us and lowers his plow face scrapping the asphalt spewing dust and gravel over us as he passes. We stop in disbelief. What a jerk! We dust ourselves off and continue. No sooner does Caltrans go by, but another car comes up from behind us, slows beside us and asks if we’re hiking the PCT, and if wed like a ride. “We figure your off track a bit”. 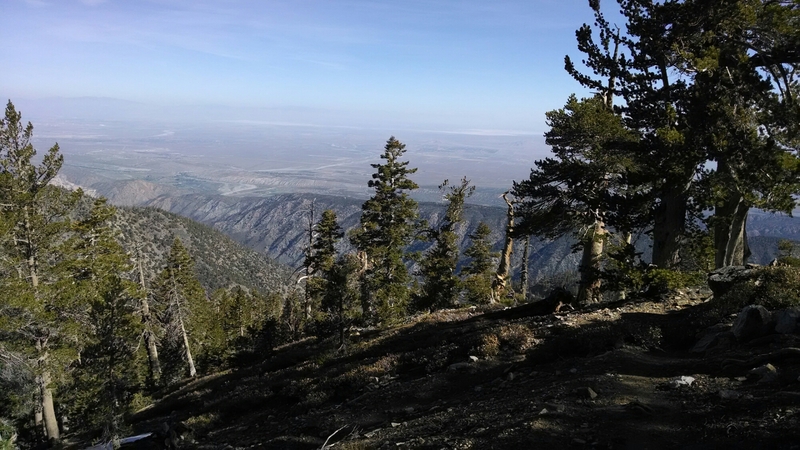 Why yes we are and YES we will take a ride to Islip Saddle if you please…4 miles down the road. 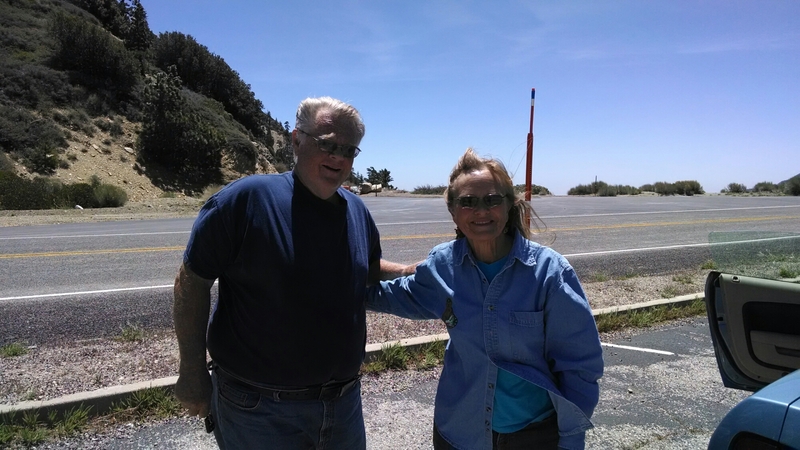 We are grateful that Dan and Susan that live in Agua Dulce and are familiar with the Saufley’s (a house trail angle) and more importantly PCT hikers. They apologize for the cramped conditions (its a Mustang they are driving and we would ride on the roof if necessary), but we don’t care. They tell us they are headed home to Agua Dulce and by chance decided to take this route. Lucky us! They drop us off at Islip Saddle. We thank them profusely. They pick up another thru hiker who is thumbing for a ride at Islip Saddle. Somehow we mistakenly think that there would be water at Islip, not necessarily. There is parking, a pit bathroom and recycle bin. No water. Decision time. 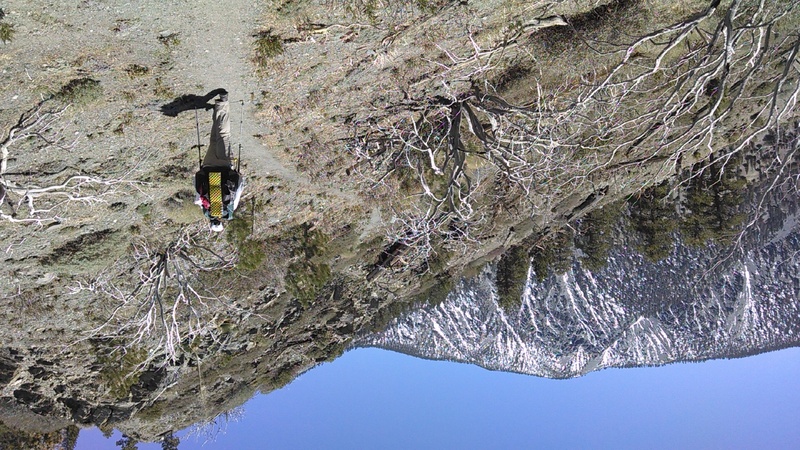 Walk UP the two miles to Little Jimmy Springs from the Hwy, or…try and Yogi some water. Yogi it is. Thankfully there are two cars still parked in the lot. Paul contacts Allen who is throwing away trash. Score! Does he have water, why yes he does! How much do we need, he asks. He asks about the PCT and all it entails. We talk for a bit as we fill up and camel up for our trek to Buckhorn Campground. Off we go again. We hike 3 miles and the trail loops around back to the Hwy. Crossing the Hwy is a picnic area which is the beginning of another trail detour. Oh joy! The detour is to protect “the spotted frog”. We now have to road walk 3 miles on the Hwy again. Arrrrrr!! After about a mile, a car heading in the opposite direction pulled over and asked the now familiar question ” Are you thru hiking the PCT”? We proudly said “Yes”! 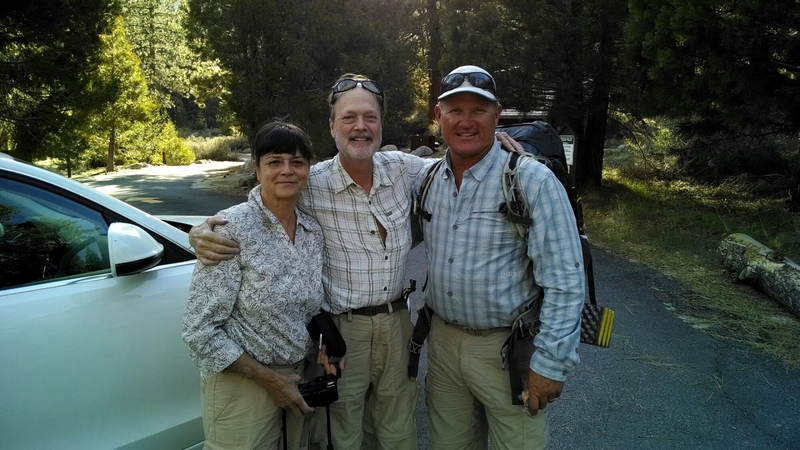 Ed and Annette were local hikers and had seen this movie before and knew we were headed to Buckhorn campground, the trailhead and the end of the detour. We accept their invite for a ride and they dropped us off at the closest campsite to the trailhead. They were very gracious, told us some local intel, and gave us some awesome trail mix! 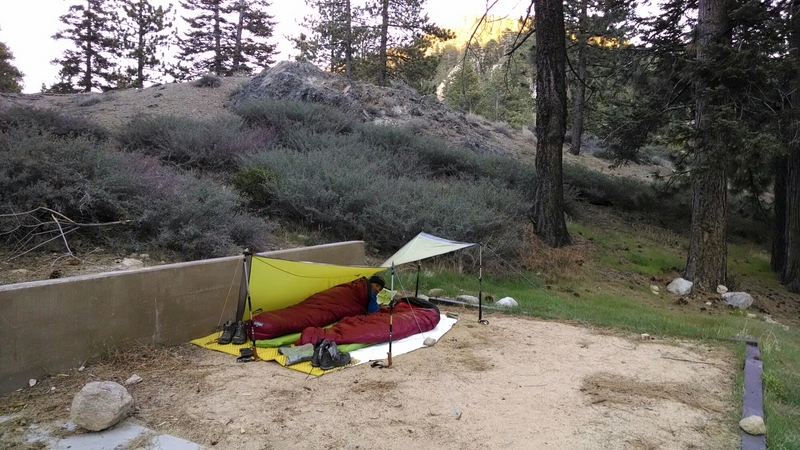 We set up camp with our tarp as a lean-to and bed down for the night. The wind had plans for us, and in the middle of the night blew our tarp into the air with a big Wuush! We quickly collected our gear and were back staring at the stars laughing about how we thought the tarp could handle the wind. Good night. Woohoo to (real) coffee and poptarts on the trail! Seeing how you two handle things has been refreshing. Hike on! You guys are an inspiration. Way to go! We’re thinking the missed turn might have brought tears to our eyes…..or ice cubes.